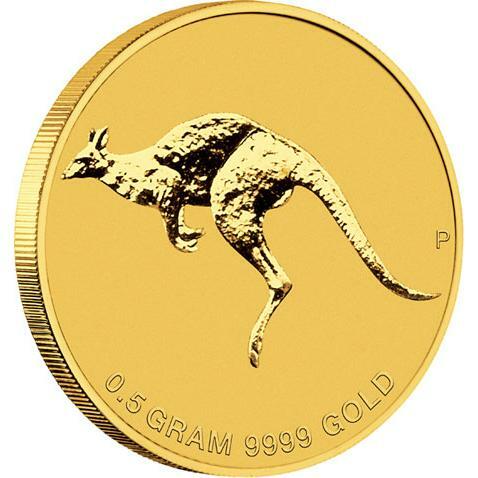 Although I don't think Gold is likely to be a good investment at current prices (I bought a few ounces several years ago when the price was around $500 and ounce, so it now appears a bit pricey at almost $1500 an ounce) I just bought a dozen of the new 2010 0.5 g "Mini Roo" 99.99% gold coins from the Perth Mint. I had a couple of gift cards that were due to expire in a few months, and I was at a loss of what to use them for. I had previously used a similar gift card to 'donate' money to myself via Paypal, which allowed me to "cash in" the cards for almost face value, but the latest cards didn't work for making donations. I'd also used such cards in the past for buying petrol and groceries, but the two main supermarkets chains (Woolworths and Cols) no longer accept these cards, nor do the related petrol chains. So buying gold coins seemed a reasonable use for the cards. I could have bought a single half ounce bullion bar, but I decided to buy the Mini Roo coins even though the value of the gold in these coins is only about half what I'd get buying a gold bullion to the same value. Mint condition legal tender gold coins are always priced at about twice the value of the gold content, and at a much higher multiple of their face value as 'legal tender' (the 0.5 g gold coins I bought cost $49,95 each, contain gold worth around $34 at the current spot price, and have a face value of only $2!). I decided to buy the mini roo coins as they are cute (only 11.6 mm in diameter and 0.7 mm thick) and I can give them to DS1 and DS2 and Christmas gifts (I'm sure the boys will like having some real "pirate treasure" gold coins - although I'll have to make sure they don't lose them!). I'll probably also add some of them to my stash of end-of-the-world emergency supplies. The coins are easily recognisable as being solid gold and government issued, so they should be easier to trade than bullion bars in a post-apocalypse scenario. Most likely they'll just sit around and eventually for part of the family fortune. In the long term gold may at least keep it's current value, so it's probably no worse than having cash in the bank and paying taxes on the interest.